This Little T started life as a partially built model that I picked up a few years ago in pretty decent shape and it was only missing a few pieces . The missing front tire I robbed from a '58 Thunderbird kit and a couple of suspension parts I got from a Revell Boomer T-Bucket . It wasn't a "Glue-Bomb" either , in fact it was literally falling apart everytime I touched it ! After it was completely disassembled I cleaned all of the parts , touched up the chrome , and polished all of the red plastic parts . To add a little extra detail I sanded the tires and grooved the slicks then sprayed them with some Dull-Cote . The only thing I added to the model is the header flanges and the Ford script decal on the radiator shell , the rest was built completely stock just like it was meant to be ! For a 48 year old kit this builds up into a beautiful model . 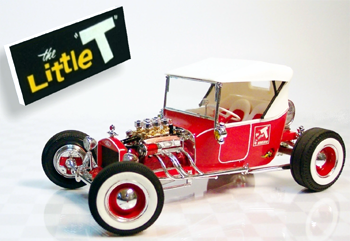 And those headers and wheels are about the nicest you'll find on any T-Bucket kit !